Although references to stigma were commonplace in the field of social policy and elsewhere, the concept was often used in a rather imprecise way. Originally published in 1984, this book assesses the relevance of the concept of stigma for the study of social policy. Investigations of the concept within the welfare field have tended to be far too narrow in focus (i.e. the concept has been regarded as a technical problem which can be eradicated by greater adherence to the principle of universalism). 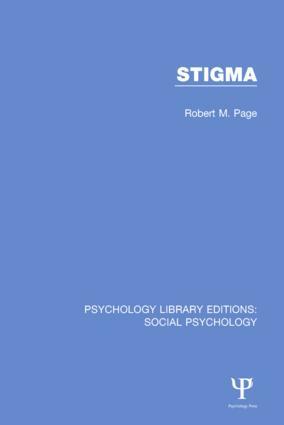 As a counter to this perspective, Robert Page argues that it is necessary to distinguish much more clearly between various aspects of the concept of stigma (e.g. stigmas, stigmatization and felt stigma). He examines the reasons why, and the ways in which, one particular ‘welfare’ group – unmarried mothers – have been stigmatized over the centuries in order to highlight the importance of examining existing patterns of ‘welfare’ and other forms of stigmatization within their political, economic, social and historical context. It is concluded that stigma will continue to be a key concept for both students and practitioners within the field of social policy provided that it is examined from this wider perspective. Acknowledgements. 1. The Anatomy of Stigma 2. Stigma: The Social Administration Approach 3. Stigma and the Unmarried Mother 4, Stigma and Social Policy: Wider Dimensions. Notes. Bibliography. Author Index. Subject Index. Psychology Library Editions: Social Psychology (30-volume set) brings together an eclectic mix of titles from a wealth of authors with diverse backgrounds, seeking to understand human behaviour and interaction from a socio-psychological perspective. The series of previously out-of-print titles, originally published between 1908 and 1993, includes those from some authors considered to be founders of social psychology and traces the development of the subject from its early foundations.